Remember my post on Wednesday about United’s reservation system not being very friendly? Well there were some people at United who were very concerned that this could be an unknown error and they wanted to get to the bottom of it so it didn’t happen again. After doing some research, it’s become clear that this was, despite how it originally looked, a US Airways problem. United please accept my sincere apology for scolding you over your res system. It has had plenty of issues over the last few months, but this wasn’t one of them. While I don’t know the details of exactly what happened, it was either an agent error or a tech problem on the US Airways side that canceled our flights. There were reasons why that didn’t seem likely when this first happened, but due to some strange technical quirks, things didn’t quite appear as they were in reality at the time. So, US Airways, boo on you. United? Again, I’m sorry. Brett, outstanding ethics, leadership and integrity! Or was the story posted before fact finding and research were finished. So did the babies’ reservation in the UA system get deleted when the PNR was split in the US system? Or did they babies get wiped out when the sitter’s new PNR was deleted? (that would seem odd, as the new PNR presumably had no connection to the old one as linking of PNRs isn’t actually a feature as far as I know). So perhaps the safe approach is to call and have them split. Then verify and hang up if everything is okay so far. Then call again, get another agent and have them just deal with the one PNR you want deleted. UA, much to my surprise, is indeed getting better. A lot of that is CO, which may be getting worse, but I’ve had better UA experiences the past several months than I’ve had in a long time (written from a UA Club). Party of 3, one doesn’t travel – reduce or divide/cancel? How should SHARES and the agent handle that scenario? PF – It should be divided and then the party not traveling should be canceled. It appears that’s what happened from the US Airways side, but then the original reservation was also canceled. It’s unclear, however, whether that was agent error or a technical issue. Commendable, your apology to United, but the same problems ARE STILL HAPPENING WITH UNITED AS WELL. Just lost a customer a few days ago whose flight segment did not change in any way, there was no change of equipment nor a schedule change. This was not a code-share booking but was done directly with United. He was bumped from his preassigned Economy Plus seat to a middle seat in the rear of the aircraft. He was a saavy traveler, expected to get what he paid for (he paid a full coach fare by the way, over $1,000). This passenger remained calm throughout the check-in and proceeding debacle but then felt totally disserviced over losing the seat assignment, ultimately choosing to cancel the reservation and get rebooked over to Delta. Equally frustrating for United Agents ?…..they cannot get a seat history in SHARES. They cannot determine if there has been a change in equipment. Totally legitimate questions that the passengers have. FASTAIR had all the history….original seat number, schedule change or equipment change information, if and when seats were changed and by what agent/ where located. Best of all ?…..it robotically was able to re-seat people equally to what they had (exit rows, aisles, windows, families together, etc.). It wasn’t perfect but worked this way in most cases. Divided passengers did not lose seat assignments. SHARES can do none of this. 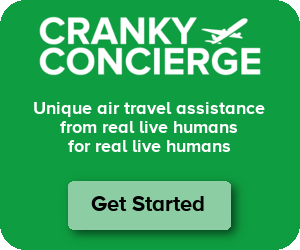 Yes, I must agree with Cranky, UNITED Customer Service has improved CONSIDERABLY! As for US AIR, I shudder to think what will happen to passengers who are stuck with them if the meda merger goes through! These screw ups will be business as usual. AND – Don’t expect any mercy!